I think we should all consider moving to Korea. Hot guys, awesome food (spicy kimchi anyone? ), and freaking ridiculously cheap skincare and cosmetics! 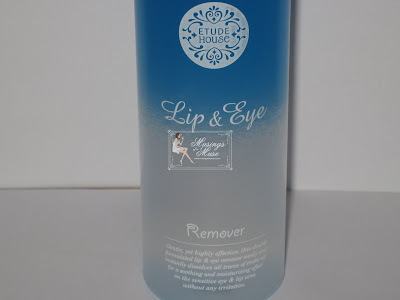 Etude House has an Eye and Lip Remover for mere pennies and it works a treat too! 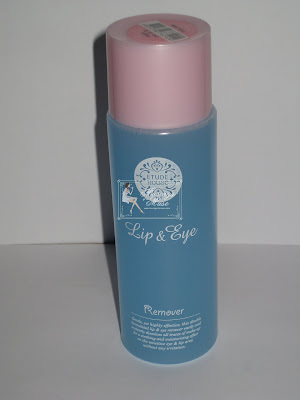 A friend of mine recently sent over a CP she did for me and she included a bottle of Etude House’s Eye and Lip Remover as a little gift and I must say it’s a rather awesome Steal and a Deal. Totally a Beauty on a Budget find the only problem is getting your hands on some for a good a price as you would if you lived in Korea. Knock, Knock! Hello? Etude House? Please come to the U.S.A.! The Muse and her friends here at Musings would be eternally grateful. I tried this with various eye shadow and mascara combinations and so far it’s gotten everything off without a problem ASIDE from my Beaute de Kose mascara. That it wasn’t so successful at removing however it’s no fault of the formula. I’ve come to the conclusion I need gasoline soaked towels to remove Beaute de Kose mascara! That stuff is like permanent ink! On everything else is did a simply great job of removing all my shadow, waterproof mascara, and whatever other eye makeup I was sporting toe the day. Strangely enough the smell of this is kinda sorta like old lady perfume but I didn’t really find it unpleasant and thought it kinda added to the novelty that is Etude House. 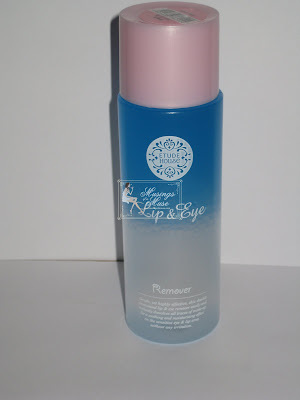 I believe a bottle is about $2-$3 USD or so and at that price you can’t go wrong as it works just as good as the Sephora Eye Makeup Remover I favor. It’s not Lancome Bi-Facil but it is a rather awesome little find should you get it for cheap. The Muse likes it and gives it a Muse Approval for purchase! Oh Muse, why do you find things that are so hard to find in the US??? I must have it!!! I wish I was such an addict back when I actually lived in Japan and had access to all these great brands! Such a waste! you’re getting me hooked on etude stuff already and i haven’t even tried that brand! when i went to hong kong in may, i wanted to get some of the stuff from the peach line but failed miserably in finding it, but now i’m going to korea for a year to teach english and i’m sooo hyped up about getting a whole bunch of etude stuff! whoopie! i probably gonna end up spending a whoole whack of money on cosmetics, especially if they have the kanebo stuff at super cheap prices. do you happen to know what the approximate prices are in CAD or USD? Wow, this sounds like good stuff! I’m now all curious about all the asian makeup you like. Wow that’s cheap! Why do I get the feeling the shipping fees will be more expensive that product, hurh hurh. Anyway, Maybelline and Loreal have similar products at affordable prices. About 7-8 USD each I believe. I swear by these two brands. I’m sure many other readers have said this previously in the other posts, heh. I had no idea you lived in Japan! Awesome! Yak you’d have a massive collection if you did lol! lol! 🙂 I’m bad for creating evil lemmings millie! I dunno if EH is available in China! I know they recently opened a shop in Malaysia! Oh my god can I come with you!? Believe me you’ll spend less than you realize. It’s VERY cheap in Korea! Prices for EH are extremely cheap! Most expensive item is prob $15-$20 USD at the most. Eyeshadows are like $5, blushes are like $8, skincare ranges from $8-$12 USD. It’s extremely cheap! It’s actually pretty good for such a cheap $! Very!!!! LOL! Probs so 🙂 Maybe $4 for shipping? So not too bad! I haven’t tried either one but I did try a neutrogena one but I didn’t like it 🙁 sniff! Hey Izzy, the packaging looks pretty similar to a fellow Korean brand U-Nuoco. Have u heard of this brand? It’s selling in SG but I didn’t buy their products. The packaging looks kinda cheap and the samples always look dirty. i tested out the base which u had, peaches smells so good! quite mattifying! i am eyeing on their bb creams and concealer too, there's so much to buy! Yup! have heard! Never seen the remover though!? Ew hate cheap packaging and dirty samples yak! Sephora is legendary for dirty samples poo! I hope it gets to SG too. I hear they are trying to expand worldwide! how cool if we got one in the US! A girl can hope! I prob did but my inbox is sickeningly unorganized 🙂 Will get to it shortly. Forgive me!? Thanks honey! I appreciate it greatly MWAH! I love that base it’s HG for me! Which are the cookie blushers? The ones with the stampl? LOVE the bleam blusher…so shimmery and gorgeous! I have the peach and it’s yummie over other blushers! Awesome! Really?! I haven’t seen it in the big jar! Want! Oh my gosh you’re so lucky! 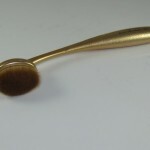 it comes with a puff instead of a brush 😀 in a round pan. i am so jealous of you too! there’s so many stuff we just don’t get here too!! oh yes! Those are cutes! Aw I know the feeling totalllllllly! aw not at all 😉 I appreciate it big time! 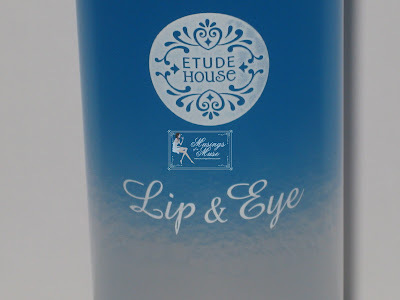 Muse, where do you buy your Etude House stuff? Thanks! a friend in Korea shops for me beautiful canvas. I am loving Korean products!